Life, Doctor Who & Combom: Big Finish to adapt Gareth Roberts novels. Big Finish to adapt Gareth Roberts novels. 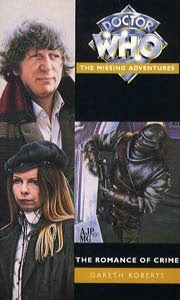 Good news to all those who like the Season Seventeen dynamic: Tom Baker, Lalla Ward, and John Leeson are all starring in audio adaptations of a couple of Gareth Roberts' Virgin Missing Adventures. Big Finish has a nice long news summary on their website. It seems to have been producer David Richardson's idea: "These will be adaptations of the Missing Adventures novels that Gareth wrote for these characters...I read The Romance of Crime and The English Way of Death about a year ago, and completely fell in love with them. It had struck me that they would make great audio stories, and so when this team came aboard we approached Gareth for the rights to make them." “The Romance of Crime is an outer-space story set on a futuristic prison where the executed criminal Xais returns to wreak revenge. The English Way of Death is set in 1930, where an evil creature named Zodaal threatens the future of the world. "Big Finish also hope at a later date to adapt Gareth’s novel The Well Mannered War, thus completing his trilogy of Fourth Doctor novels." 'nuff said. You can preorder it here. A Big Finish production starring Tom Baker and Lalla Ward? FINALLY!!!! Just take my money now! I don't think Tom and Lalla are actually gonna do stories together. Perhaps just separately. That's great news. I enjoyed those books when they came out all those years ago.